Newsletter July 2017: Zen and the Art of Motorcycle Maintenance - SKMurphy, Inc.
Our July 2017 Newsletter focused on key insights for entrepreneurs offered by Robert Pirsig in “Zen and the Art of Motorcycle Maintenance. If you have not had a chance to read it I would encourage you to put it on your summer reading list. This blog post summarizes our July 2017 newsletter: you can subscribe to the monthly SKMurphy newsletter using the form at the right. 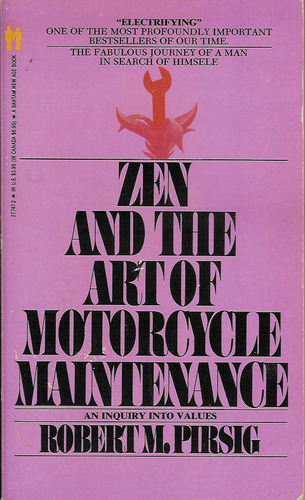 If you have not read Zen and the Art of Motorcycle Maintenance” by Robert Pirsig, I would encourage you to add it to the top of your summer reading list. It offers a valuable perspective on both debugging problems in your startup and your life. I first read it in high school and was profoundly affected by it. I re-read it every few years and am surprised by the insights I overlooked. I have actually blogged about it five times over the years and I want to use this newsletter to focus on three key insights that Pirsig offered. “An adequate supply of gumption is the first and most important tool. If you haven’t got that you might as well gather up all the other tools and put them away, because they won’t do you any good. The risk is that the future has arrived but is “unevenly distributed” so we reject the harbingers as outliers. Our Peer Advisory Boards will be discussing one chapter from “Anything You Want” for our July and August meetings. Please let me know if you are in Silicon Valley and would like to take part in a session. If you are interested but not in Silicon Valley please let me know and I will set up a Zoom session for a group discussion in July and August.